Protection from the sun and smelly things. Maybe the sun has increased in power so it's now capable of burning through most common clothing material? Maybe it's a new conspiracy and the clothing companies have banded together to save us from dangers we never knew existed? Maybe it's a marketing ploy. No matter the reason, just more proof that it's wise to stay inside. With the doors locked. These little devils will grow up to be big devils. Then they will stuff us in our lockers. For wusses, this time of year is almost as good as the first day of gym class. Almost. We've just about settled into school. We know our safe routes and our secure lunch spots, then Bam! Halloween arrives. Time to be scared just a little more; remember, we have a new semester coming up after Christmas. I think we signed up for weightlifting too. Here is a small list of our scariest movies for the All Hallow's Eve season. No top-down order, because they all scare us. Even now. I'm glad this was written with the lights on. It's written by Stephen King (a sincerely creepy guy). It has bad elevators (which are scary enough... small spaces, small spaces). There are lady ghosts showing their lady parts. Scatman Crothers gets it with an axe, and Shelly Duvall has a really bad runny nose. Made in 1980 it's still one big pile of scary. Ick. Again, another oldie, but a real scary. It's got an incredible get under your skin, then make your skin all puss-filled and icky quality. Plus it caused us to ask our moms to stop making split pea soup. Ick. Ick. Ick. Just put the Ouija board down and walk away. A little confusing. A little creepy. Then scary. Then sad. Then leaves you for dead. Paced so carefully. When it's on you can't help but sit down and watch it, then remember you left the kids in the car. The car you drove off a cliff, and yet everyone is sitting comfortably watching TV, how is this possi... oh dear. Holy Freaking Crap. It's in Alaska... not a place for wusses in the first place. Then you learn it stays completely dark for an entire month. Then these vampires speak to each other by doing that sucking-in-air screaming thing. Not to mention their frightful fingernails and really sharp teeth. Makes Gary Oldman's Dracula look like a botanist. The music. The mask. The guy who just won't die and continues to do this creepy thing of appearing in the background of almost every scene. Not something to watch alone. You need to see it. Just the first one. It's the only really scary one, and although older, it's still got some good jumps in it. Besides Norman looks like a solid locker partner. There are plenty of others, but now we've gone and frightened ourselves. Maybe weightlifting won't be so bad after all. Ha. Who are we kidding? Affection can be a great thing. Please do not misconstrue this entry as a cry against affection or its occasional public display. The Wussola University study here concerns couples who cannot stop holding hands. Enter the cursed buffet-line Kabuki. The couple in front of you who, acting like siamese twins, cannot separate clasped hands from one another to execute individual food choices. It’s a Darwinian microcosm: either they let go for a blinding moment of solitary existence, starve to death, or work as one to give each other sustenance. Hands fused, a clumsy dance of plates up, plates down, servings spoons up, serving spoons down will ensue. It’s a ghastly site to behold. At a private party this ritual is especially painful; not only are you required to stay in the quasi-line, but the general pace of progress around the table is ground to an excruciating halt. “Oh, there’s some of that salad with the marshmallows and oranges...” Thing One furtively holds out a plate. Thing Two puts down its plate, retrieves the spoon from the bowl of Frog Eye salad and places a small spoonful on Thing One's plate. The coy playing begins: “Oh, maybe just a little bit more.” They chuckle as Thing Two jokingly places another baby-portion on Thing One's plate. “A little more than this?” Tee hee hee. Again, another baby-spoon plop of pasta and marshmallow. More chortles. More knowing glances, maybe even a “Oh, silly, leave room for the chips." This continues through the spinach salad, the greek salad, the chips and the finger sandwiches. Unknowingly, the world around them continues to turn. Babies are born. Elders pass away and the grip stronger than a thousand titans holds true. Your time is theirs. Once the offending couple sits to eat you hear the unmistakable uncoupling of train cars... chunk, clink, tink, the hiss of steam and the medical miracle of separating the twins has occurred . They nibble away in multi-digit bliss. They will finish at the same time, then like the Phoenix, they will rise from their ashes of separation and, hand-in-hand, place their paper-plates in the garbage -- just in time for you to get behind them in the dessert line. Even the veritable Nicholas Cage appeared in Fast Times at Ridgemont High. Amazing. If you scour the internet for the origins of the word "wuss" (and if you've been doing that, I'm sorry. There must be something more productive for you out there. The world is a big place. It's your oyster, go out and get it. Or at least go for a walk.) you'll likely come across a plethora of credits lauded upon the 1982 movie Fast Times at Ridgemont High. Mike Damone, a smooth operating skeez of a character in the movie is quoted saying "Ahh, you're a freakin' wuss! Part wimp, part puss!" And vîola! You have the creation of a new word. Right there. Bam! Like lightening coming from heaven and making a lightbulb. -- English novelist, and founder of the British school novel genre (and nap starts in 3, 2, zzzz), Thomas Hughes wrote of "wuss luck" in his chart-topping 1857 page-turner "Tom Brown's Schooldays." -- Harriet Beecher Stowe used it in 1852 in the anti-slavery classic, Uncle Tom's Cabin: "I may bring him up in a year, not much the wuss for wear, and trade him back." -- In the catty 1847 social drama, Vanity Fair, William Makepeace Thackeray applied it in a rather modern(e) way: "and his man Flethers is wuss, and have made such a row in the housekeeper's room about the dinners and hale, as no lord would make--." Wuss has been around a long time. The examples cited are some of the more well-known references, but there are many more. More importantly wusses have a proud heritage; our lack of courage and inability to weather just about any storm has been duly noted within the annals of time. So, the next time you feel picked upon, know there have been many who've gone down the very same road... and also chose not to defend themselves as well. 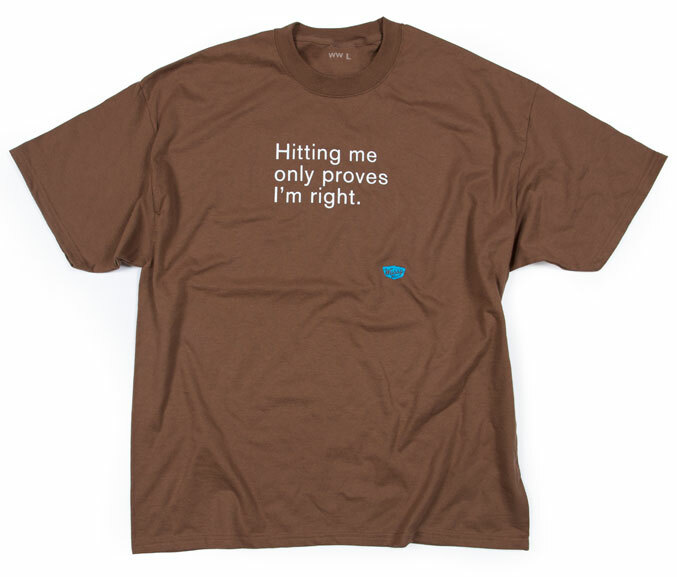 Yes, hitting me only proves I'm right. And in need of a dentist and a new pair of glasses. Because of our lingering asthma and needed inhalers, we likely can't outrun our attackers, so we rely on the power of a well-turned phrase to really stick it to them just before our lights go out. We dream of witnesses to the pummeling saying "Boy, that wuss sure got the stuffing beat out of them, but did you catch that sarcastic phrase?" That never happens. We just get beaten into next week. Yes, hitting me only proves I'm right, it also proves you are bigger than me and have the power to fold me to fit comfortably into a Chinese take-out box. Here are a collection of beautifully crafted closing statements from some of the greatest minds in history. Sadly, not the greatest wusses in history, because, let's be honest, there's really no such thing. The resound grand turn of phrase only happens in movies. In reality we're likely to have the most stunning sentence in the world cut short by the inclusion of a fist in our pie-hole. But in our minds it was grand, so very, very grand. Look at those high spirits as they patiently wait for the inevitable to happen. Wusses are excellent at judging space. Especially when it comes to space in which we can potentially find ourselves residing. Whether that be hiding in a small nook while a band of bullies goes waltzing by, or after the bullies extricate you from the nook, stuffing you in a nearby locker. No matter the reason, we know how to gauge size. Now a bright and enterprising someone has gone and devoted an entire blog to the idea of letting others show us how they have managed to fit in some incredibly small spaces. It contains an impressive array of places from around the world which make you question the greatness of that whole David Blaine in a plexiglass cube thing. Wusses, visit the blog, research it well, and print off some references for later use. Above all, take pride in your ability to hide. "Hey, I can fit in there." A small will be fine. Well maybe a medium. But never, ever a large. Like everyone else, wusses have to eat. We tend not to eat a lot, otherwise our spindly little arms may gain some needed girth. If you know a wuss you'll see some interesting aspects in their dietary choices. First, wusses won't go after a greasy hamburger, but we will open-palm slap an octogenarian for McDonald's fries (small, okay, maybe a medium). Wusses will decry large buffet restaurants, but will easily down a Subway footlong sandwich at virtually any time of day (besides, they are only $5). Secondly, no spices. We are pansies. While we're on it, Fiji bottled water has a little more kick than it should. "Power" waters are right out, we're nervous about what's really in them. Tap water is also right out, do you know where that water's been? It's a hard-knock life. A clean glass of aspertame-laden Diet Pepsi with lemon would be nice. But to repeat, no spices. Pepper is a spice. Cinnamon in my slightly above room temperature cocoa? No, that's a spice. Curry? Really? You have to ask? Now where's my Diet Pepsi? Thirdly, you can always be safe dining with a wuss. We will never eat anything off your plate. Plus we will never embarrass you by sending something back to the kitchen or make a special request. That might lead to a conflict, and no one wants that. We like Chinese food because the menus lay out the expected behavior in no uncertain terms: "no substitutions." We like that. Steamed rice will be fine. And a lemon in my Diet Pepsi would be great. Oh, no lemons, okay. And it's Diet Coke? That will be fine. Thank you. Buzz, buzz, buzz. Sting, sting, sting. Bite, bite, bite. Fun. For wusses there's something for us to fear in all four seasons. Winter, cold, and slippery ice. Spring, allergies; no guesswork needed there. Fall, nuts falling from trees and Halloween. But those three don't hold a proverbial candle to the most danger-laden season of all: Summer. Summer is fraught with sunburn, boating accidents (remember, never go on a boat, never), hot pavement on bare feet (like you'd be caught without proper foot ware), out-of-order air-conditioners. 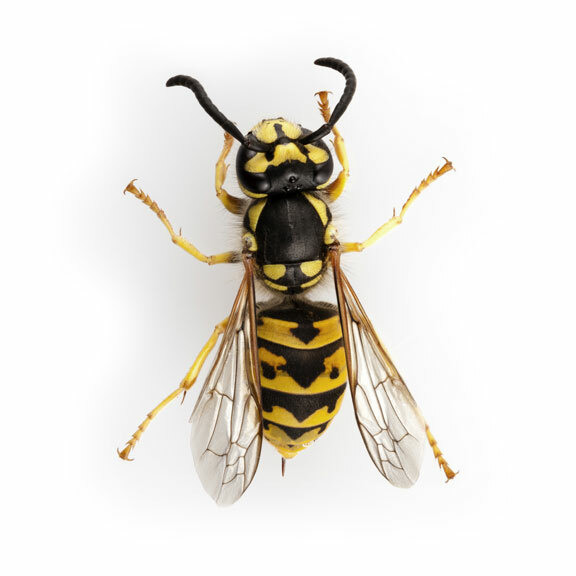 But the most feared of all is the category owned by buzzing, stinging, biting insects. Horrible. They buzz, which is irritating. But when they stop buzzing they either sting or bite, which is painful. There's no win with buzzing, stinging, biting insects. When encountering a buzzing, stinging, biting insect it's best to: 1) start flailing your arms about wildly. 2) start running. 3) start screaming. Don't worry about trying to keep these steps in mind, you'll likely be doing them already. Love Beets? Love beatings. Do yourself a favor and pack a sandwich instead. And make it something brave and meaty. The name couldn't be more descriptive: Beets. Bring one of these adorable pre-packaged snack trays to lunch and you'll score a win for good digestive health. Sadly, you'll score a loss for good bone and tissue health as your ensuing bruises age to match these little beating catalysts. One great advantage to the natural purple coloring is when people react to your adjusted dental work, you can ease their concerns by slurring "Don't worry, it's just the color from the beets I had for lunch." 'Course, no one will believe you because as soon as you tell them you had beets for lunch they will be required to hit you as well. Cheddar cubes and crackers are included. Bon appétit! All that screaming and toughness are merely a wall. A big wall to hold in all those tender emotions. This has been around a while, but it's worth a review: Blender Magazine has defined the top 25 Wusses of all time (within music). Give it a read here. The bigger issue: they project a mighty, mighty tough in our nighty image, but man, seen their documentary? C’mon guys, let’s be honest. The music sounds tough, but that’s a pretty thin veneer. Oh, look, now we’ve gone and hurt some feelings. Sorry. Sticks and Stones. Part 1. A fresh can of choice quality pea soup might be coming straight for your noggin. There are a variety of ways to break bones. Sticks and stones are remarkably effective, but where does that all start? With the right words of course. Here's the first of many short lists of words guaranteed to win you a flurry of sticks, stones, broken bottles, garbage, soup cans, you name it, headed in your direction. Pepper your language liberally. Best wishes. 1. Etymology. The foundation or history of words. Knowing what a word means is one thing. Knowing the word which tells others you know where the word came from is downright irritating. Using that word in place of "history" on everything makes you a candidate for the business end of blind rage. For example, "It all depends on it's etymology." Now, go find the history of the word "bruise." 2. Diaspora. Scattering or migration of a people or civilization. Newspeople love to use "diaspora." Newspeople also love to use words incorrectly. Hence, fans of newspeople tend to do the same thing. Both are in need of a good beating. A couple of possible phrases: "There's been a real theatre diaspora in this town." Or "Fans are upset over the high school wrestling diaspora." 3. Antediluvian. Old fashioned or antiquated. The word scores on two levels: 1) Its got some Grade A Fancy pronunciation requirements, and 2) it sounds very sci-fi, like a line from a character in Dune (page 2,045, third paragraph) "Don't worry, the Antediluvians will rescue us from the sand worms!" Suggested phrase: "Your antediluvian sense of décor is so quaint." Extra frog in the arm for using "décor." Just saying the word leaves your mouth dripping with pretension. If you used this while chatting it up at the Harvard English Department Mixer, even they would worry you're exhibiting the first signs of having a stroke. And not a stroke of genius. Nonce makes others feel confused, then bewildered, then tired of your existence. Try this one: "The rain seems to have stopped, at least for the nonce." See? Smack. 5. Antipodal. Opposite or opposed. Similar to nonce in that it's high on the pompous scale and it seems like a mistake no matter how you use it. For example, "On the graph we have our starting point, now who can find it's antipodal point?" Wha? Is there a formula for that? Or "Oh, you and your antipodal sister." My sister's antipodal? When did this happen? You'll likely be punched in the neck. It’s okay. I brought my guitar. Jack Johnson? Stairway? Coldplay? Yeah. Coldplay. Curious how to keep the beat, plus receive one? Bring an uninvited guitar to invited events: birthday parties, weddings, camping trips, family get-togethers, funerals, etc. We promise, no matter the occasion, everyone will want to beat you. Do you see trumpet players bring their trumpets? Oboe enthusiasts? How ‘bout a nice slice of tuba? Even more portable instruments like violins and flutes fail to travel as easily as a guitar. Does the guitar player sit at home stewing whether or not the host has planned enough entertainment? They don’t seem to show the same concern for the quantity of spinach dip or soda, so why the guitar? Playing the guitar is great. People with the ability to organize their digits in a way to produce music, and do it well should be heralded. Just like any other talent worth pursuing the guitar takes patience, time, and a willingness to develop some healthy callouses. Those of you who play, by all means, play away. If someone invites you to their house and asks you to bring your guitar, do it, you must be good, they want to hear you play. Do Freebird with a smile. Consequently, chances are likely those who darken your door with six-string in hand are not great players; lots of chorus chords and stops accompanied by concentrated string studies. Of all the really good guitarists you know, how often have they showed up with their axe? They carry it when it has to go somewhere. Not necessarily when they have to go somewhere. Those deserving a beating will generally wear the guitar case backpack style so they can play the “Hi... whoa! How did this thing get on my back?” entrance. It’s a sad thing to watch, but as you’ll soon find out, an even worse thing to hear. Maybe these should be worn all the time? Never know when you'll fall into a drainage ditch. Did you know there is an actual organization known as Wuss? It's the Western Users of SAS Software. Amazing. They have sponsors and everything! Their conference is this November in beautiful Las Vegas. I wonder if other software groups show up and pick on them. Everyone should get tickets and go! Then stand around and ask "So, what's SAS Software?" Then go hit the slots, enjoy a buffet or two and go back to the hotel for a nice swim. With princess arm-floaties of course. 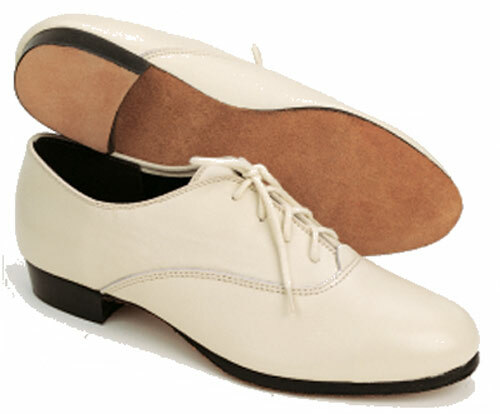 Thin-soled men's dancing shoes have long been a quick marker for someone begging for a beating. Have you been feeling a little down lately? Lost the spring in your step? We have a solution. Pick up a pair of these regal slippers and soon you'll not only feel like Gene Kelly in a rainstorm (google it), but you'll feel like running as hordes of brutish types descend on your pansy little self. Few pieces of clothing scream "Please, for the love of all that's holy, hit me." like men's dancing shoes. The soles are thin and wimpy. The shape is fairly nondescript (don't want to compete with the spandex outfit your mom made). The number of lace holes has it confused with a pair of basketball shoes (can you feel the tension?). And the heel is teeny, tiny... for your teeny, tiny foot. Like most specialty shoes, these yell that they have a purpose. Sadly the true purpose is getting you hurt, and we're not talking from those shin splints you got trying to copy the moves from "Bringin' It To The Street, volume 4." We promise, these shoes will let everyone know you are to be trifled with and beaten. Note: The lighter the better.